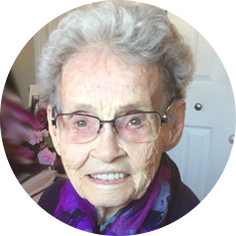 It is with great sadness that the family announces the passing of Irene Mary Bradford, aged 92 years of Moose Jaw, SK on Saturday, November 17th, 2018. Irene was born to Anton and Catherine (née: Haubrich) Kraus on the family farm near Hodgeville, SK in March of 1926. She graduated from Hodgeville High School and received her teacher’s education at Moose Jaw Normal School and the University of Saskatchewan. Prior to her marriage she taught school at Ravenscrag, SK, Gilroy, SK, Chamberlain, SK, and Estevan, SK. After her children were in school she returned to teaching elementary grades at Central Butte, SK. Irene strongly believed in education and continual learning, a value she acquired from her father. Irene established the first kindergarten program in Central Butte prior to it being funded in the provincial school system. Irene met Bud while teaching at Gilroy and they were married in Moose Jaw on July 24th, 1948. They raised five children: Beverly, Colleen, Dean, Yvonne, and Lynette on the Bradford family farm near Lawson, SK and later in Central Butte. Irene was actively involved in community events: the Home and School Association, Hospital Auxiliary, Robin Hood Ladies Club, St. Mary’s Roman Catholic Church, Ten Days for Development and Peace, and many others. She was a wonderful baker and her bread, buns, butter horns and butter tarts were a staple at family suppers, social gatherings, and sought out for bake sales. Her fried chicken was the best and fueled many an afternoon boating excursion on Diefenbaker Lake. In retirement, Irene and Bud served with CUSO on a mission in Banz, Papua New Guinea. They also traveled to Australia, New Zealand, Tasmania, England, Ireland, Europe, Israel, the United States, and across Canada from coast to coast. Irene and Bud moved to Moose Jaw in 1990 where she enjoyed volunteering at St Joseph’s Roman Catholic Church, Timothy Eaton’s Senior Center, and Providence Place. She was predeceased by her husband, Bowyer (Bud) in 2012; her parents, Anton and Catherine; 6 sisters and 2 brothers; and son-in-law, Larry Signarowski. Irene is survived by her children: Beverly Signarowski (Roy Wilson), Colleen (Lyle) Sampson, Dean (Keri) Bradford, Yvonne (Russell) Slugoski, and Lynette (Greg) Clavelle; her grandchildren: Evette (Bryce) Berry, Natasha (Wayne) Weinheimer, Andrea Signarowski (Aaron Macdonald), John Signarowski, Eric Sampson (Marian Kramer), Dan Bradford (Lisa Karpuk), Lauren Bradford (David Thue), Allison Clavelle (Trevor Gleig), Megan Clavelle (Nick Mosses), and Mac Clavelle; and great-grandchildren: Jacob Signarowski, Quinn Weinheimer, Autumn Berry, Christopher Signarowski, Genevieve Gleig, Greta Mosses, Henry Sampson, Jack Sampson, Edie Mosses, and Sebastian Gleig. She is also survived by her sisters, Jean Mauer and Anne Kuc; sister-in-law, Thelma Dunn; and numerous nieces and nephews. Irene also leaves to mourn Yvonne and Russell’s children: Jarrod Slugoski, Tennille (Shaynne) Corbett, Leah (Jeremy) Roden, Ellisse Heide, and Nathan Slugoski; grandchildren: Aidan Corbett, Lydia Corbett, Jack Roden, Isla Roden, Max Roden, Lennox Heide, Chandler Heide, and Oliver Slugoski. The family would like to thank Theresa Klyne for looking after Mom with the utmost compassion and care during her final weeks, the staff at Providence Place in Moose Jaw, Regency Park Manor in Central Butte for their support and care when Mom’s health declined seriously since April, 2018, and the staff at Crescent Park Retirement Villa in Moose Jaw for their care and support during Mom’s six plus years there. The Funeral Mass will be celebrated on Monday, November 26th, 2018 at 11:00 a.m. at Church of Our Lady, 566 Vaughan St, Moose Jaw, SK. Father Joaquin C. Ibay will be the presiding celebrant and a private family interment will take place in Rosedale Cemetery. A Prayer Service will be held on Sunday, November 25th, 2018 at 7:00 p.m. in Moose Jaw Funeral Home. In lieu of flowers, donations in Irene’s name may be made to St Mary’s Roman Catholic Church, Box 539, Central Butte, SK S0H 0T0. Arrangements are entrusted to Moose Jaw Funeral Home, 268 Mulberry Lane. James Murdock, Funeral Director 306-693-4550. My condolences to the family on the passing of Aunt Irene. She will be missed. Thinking of you all. To the family- our condolences in the loss of your mother. May the memories sustain and her teachings remain. God bless you all. Our condolences to the family. Aunt Irene will be greatly missed. Thinking of you all at this time. On behalf of my mom, Tessie Haubrich, and her family, our condolences.